Ottawa - should we let fear change us? ¿Cómo se dice en español DRM? Why do you think they called it "The Giver"? Bay Area female executives - who makes what? When is a freedom of information act not free? In the ideal world, you should be able to go to any merchant and use any form of payment - cash, check, credit card, debit card, Apple Pay, Google Wallet, yuan, whatever. We do not live in an ideal world, as some are discovering. Take Julio Ojeda-Zapata, who went to a CVS pharmacy and tried to pay with Google Wallet. He posted a picture of a terminal stating that another form of payment is required. While Google Wallet is affected by CVS' move, the real news is brewing for the users of the just-released Apple Pay - and it seems that it was Apple Pay that prompted the recent payment denials. Earlier this week, Rite Aid took steps to shut down support for Apple and Google’s digital wallets. While the pharmacy chain was not an official Apple Pay partner, consumers were able to use the payment system with existing NFC payment terminals until a short while ago. But now, CVS is following suit. CVS sent an email to its stores saying that NFC support is supposed to be turned off and that the company will not accept Apple Pay. The email went on to say that cashiers should be instructed to apologize to the customer, explain that CVS does not accept Apple Pay, and then inform the customer that it will have its own mobile wallet next year. Through Twitter, and various media outlets, consumers are confirming that NFC support has been turned off at CVS stores today. Why? Because CVS and Rite Aid, along with several other retailers, are members of the Merchant Customer Exchange - and they are rolling out their own mobile payment system, CurrentC. Why? Because their system cuts out the middlemen (banks and credit card companies) and gets money directly from the consumers' bank accounts. There's only one problem. If you go to a Rite Aid or a CVS and try to pay with CurrentC, you can't use that either. Not until 2015. Of course, CurrentC does have some advantages, including the fact that the technology doesn't require the latest and greatest phones to work. However, the fact remains that Google Wallet and Apple Pay will be available during the holiday shopping season, while CurrentC won't. That probably won't have a big financial impact on the retailers that won't accept any mobile payments, and the hubbub may be confined to the tech-weenie circles. But when you're talking about something that you want early adopters to champion, it may be hard to find early adopter champions for CurrentC. And here's another insurance item. I haven't written about Ebola all that much, since I'm spending 25 hours a day expressing my concern about ethics in videogame journalism. But I guess there are a few people here and there talking about Ebola, especially since the news media airs EBOLA UPDATES at every possible opportunity. And others are paying attention to the potential impacts of Ebola. Peter Reilly, WGA’s Healthcare Practice Leader ... noted, “Insurance for lost revenue arising out of a non-physical damage event like a voluntary or involuntary quarantine of facilities and medical professionals is not available on most Business Interruption coverage forms." Miller Insurance Services, an independent specialist insurance broker, and William Gallagher Associates (“WGA”), a U.S. retail insurance broker, jointly announce the availability of Pandemic Disease Business Interruption Insurance, provided by the Ark Syndicate at Lloyd’s. Coverage responds to loss of income arising directly out of shutdowns of healthcare facilities as well as diminished revenues in the aftermath of a quarantine. The coverage is available through highly-rated insurers in London that are licensed in the US and in other world markets. Insurance. Technically and legally it's not gambling, but it still involves the placement of a bet. You put down a specific amount of money, but if something happens to the insured item - your home, your car, or your own body - you'll get some money. A key component of most insurance polices is the deductible. If I get in an extremely minor fender bender and my car suffers a whopping five dollars worth of damage, my auto insurance policy won't pay me anything. Now if the car suffers five thousand dollars worth of damage, it's a different story. Deductibles can be very low, or very high. Oddly enough, the most valuable thing that we insure - our own bodies, in the form of health insurance - often has low deductibles. Auto insurance has higher deductibles, depending upon the policy you select. Homeowners' insurance also has deductibles at a particular level, but homeowners' insurance does not include all of the possible things that could happen to your home and its contents. [Tom] Fuller, a public relations consultant [in Napa], said the repairs from last month’s magnitude-6.0 quake won’t come close to his $48,000 deductible — the amount of structural damage his home must suffer before the insurance company becomes liable for major repairs. Yes, that's right. You need to suffer somewhere around $48,000 in damage before the earthquake insurance policy (managed under the auspices of the California Earthquake Authority) pays a single penny. Even on a less expensive home - not that there are many of those here in California, even with the housing bubble burst - you're looking at $10,000 or more of earthquake damage that you have to cover on your own. Only 6 percent of Napa County homeowners have earthquake insurance, compared to 10 percent of all Sonoma County and California residents, according to the California Earthquake Authority, the public entity that works with private insurers to offer residential coverage. Only 9 percent of state businesses had quake insurance last year, according to the state Department of Insurance. The number of residential policies has declined statewide from 1.2 million in 2004 to 1.1 million last year. In California, auto insurance is mandatory; other types of insurance, including earthquake insurance, are not. This may be unique to California - we really, REALLY love our cars. And I'll admit that I don't know the details of other types of catastrophic insurance, such as tornado insurance in Kansas, hurricane insurance in Florida, or marijuana intoxication insurance in Colorado. But in essence, the vast majority of Californians who don't have insurance are engaging in a bet of their own. They are betting that if an earthquake does damage their homes, the amount of damage will be LESS than the deductible. Of course, there's always a chance that the bet can be lost. Are Ello investors crazy? And will the anti-Ello get tsued? While a few people are already yawning about Ello and saying that it's so last week, others are starting to take notice. If you've managed to avoid all talk about Ello, this is a software service that espouses principles similar to the marketing-free folks that I complained about several years ago. Basically, Ello is defining itself in the negative, by saying that it will not do things that Facebook does. Does Facebook clutter your feed up with advertisements? Ello won't do that. Does Facebook sell its data (it's not YOUR data, it's FACEBOOK'S data) to others? Ello won't do that. In fact, the BBC notes that Ello is really serious about this. A social network promising never to sell user data or incorporate advertising ... has also become a Public Benefit Corporation, which prohibits its current and any future owners from breaking that promise. However, that's not the main point of the BBC article. The main point of the article is to note that Ello has received US$5.5 million from investors. But if Ello isn't selling ads or data, then how are the investors going to make money? And while Bouyea also notes that Fresh Track Capital is in this for the long haul, you still have to wonder if micropayments alone can fund a company. Take LinkedIn. Yes, LinkedIn is able to raise revenue from a freemium model. In the fourth quarter of 2013, it had $88.1 million in revenue from premium subscriptions. However, that was only part of its $447.2 million in fourth quarter revenue. $113.5 million of LinkedIn's revenue came from ads - something that Ello has said that it isn't going to do. So where did the rest of LinkedIn's revenue - $245.6 million - come from? From LinkedIn's perspective, "recruiting" refers to people who are offering jobs, and people who are looking for jobs. From Ello's perspective, what does "recruiting" mean? This is where the people who are yawning about Ello may perk up their ears, because there's an even newer service that is on the horizon - launched two days ago. Tsu, which launched on October 21 with $7 million in funding from Sancus Capital Prive, is divvying up its advertising proceeds with its users. Yes, you heard it right. Their model is predicated on paying YOU for actively posting on their platform and inviting your friends to do so as well. Note that "inviting your friends" part. Over the last couple of days, I've seen a couple of Google+ users urging me to join tsu.co. Now THAT'S recruiting. I guess you could say that Tsu is the anti-Ello. To understand the payouts a user is supposed to receive on Tsu, it’s kind of analogous to a multi-level-marketing model, sometimes derogatorily referred to as a “pyramid scheme” a la Bernie Madoff. Perhaps I'm reading a little too much into Callari's attitude, but when you mention Bernie Madoff in connection with a business, it's usually not a compliment. However, Callari does note that users don't have to make any investment themselves. They just agree to split the proceeds between themselves, Tsu, and the people who recruited them in the first place. Whether this will pass legal muster I don't know; tsu's FAQS are silent on legalities, and I couldn't find Tsu's terms of service. And for what it's worth, Callari is on Tsu himself. But I'm not going to link to him, because I'm not getting a cut. In the middle of the morning out here in California, I heard about the attacks in Ottawa, Canada. Having made several visits to Ottawa, and having stayed near the Parliament Hill area (once I visited an ice sculpture competition on Parliament Hill - yes, Ottawa can get cold), the news was especially upsetting. I moved to Canada in large part out of anger at the fear driven changes in America following September 11, 2001. I hated the evisceration of the US Constitution and the poorly planned aggression of the only country I had ever called home (I was born in Canada, but had never lived there before 2004). I decided that I would take advantage of my Canadian citizenship and move to a country that had not abandoned its values and founding principles out of fear. The thing that made me most happy to be in Canada while I lived there was the openness of Parliament. Even before 9/11 the US Capitol was extremely secure. The seat of American power is locked and walled away from the people of the US. Walls and guards separate the White House from its subjects. Before I moved to Ottawa it never even occurred to me that there could be a different way of doing things. It blew me away when I moved to Canada that I could just walk right up to Parliament anytime I wanted. Even in Ottawa, Krier could notice a difference in attitude between the US and Canada. The US Embassy in Ottawa is a post-modernist interpretation of a submarine, surrounded by neo-classical buildings and castles. After 9/11 the US embassy blocked off a lane of traffic surrounding the building in the middle of downtown Ottawa with jersey barriers. Inside of those Jersey barriers was a row of pylons with steel shafts that extended underground designed to stop tanks. Inside of that row of pylons is a tall fence made of pointed metal and concrete. The walls look to be several feet thick and the glass appears to be bulletproof, and there is no evidence of any windows that can be opened. The entire structure is surmounted by a brooding turret. In his post - "Dear Ottawa: Don't Let Fear Change You" - Krier hopes that today's attacks don't cause Canada to be less open, or for its government to become insulated from its citizens. Sadly, I suspect that Krier's wish won't be granted. Experience has a way of modifying your behavior. I obviously am not Canadian, so I don't know if Canadians have been walking around with a sense of innocence. However, I suspect that a desire for safety will cause changes in Canada. I'm going to tell a story about my own country - a story that predates 9/11 by several decades. Gerald Ford was President at a time when there were concerns over his predecessor's "imperial" Presidency, so it behooved Ford (as it behooved his successor, Jimmy Carter) to be as open as possible. Thus, on September 5, 1975, President Ford was walking down a street in Sacramento, California. As Ford later recounted, he was walking by the crowds when he suddenly saw a gun pointed toward him. Luckily for Ford, the gun didn't go off. However, the threat of a Presidential assassination, with all that would happen to the country, was a sobering thought. This was decades before the coordinated, multi-city attacks on 9/11, but even in 1975 there was significant worry about the threat to our country. Ford couldn't have been blamed if he decided to hunker down behind a security perimeter and keep away from everybody. Above all, one would expect that even if Ford didn't take such a drastic step, he wouldn't take unnecessary risks in California. We're all crazy here, you know. However, as many of you recall, less than three weeks later - on September 17, 1975 - Gerald Ford was walking down a street in San Francisco, California. There he met a woman named Sara Jane Moore, and, as Moore herself recalls, she pointed a gun toward Ford. This time, the gun did go off, but the shot was deflected away from the President. Several years later, someone did manage to hit a President (Ronald Reagan) with a bullet, and as a result our Presidents live their lives behind a security perimeter, walled off from the outside world. While this obviously has its disadvantages, it helps to make sure that the President doesn't die in office. And since no U.S. President has died in office since 1963, I guess that the increased security has served its purpose. And I suspect that the people in Canada are about to go through the same process. I love acronyms - especially when they are tied to incomprehensible buzzwords. When I changed jobs back in 2009, I had to ditch a whole set of acronyms and buzzwords and learn some new ones. I already have some new acronyms that are creeping into my vocabulary (WIP it into shape!). But I am not alone. Back in the 1960s, Philip Broughton declared his love for buzzwords also. In 1968, Newsweek magazine published a short, but humorous article, How to Win at Wordsmanship. It described the "Systematic Buzz Phrase Projector," a concept developed by Philip Broughton, a (then) 63 year old worker in the US Public Health Service. So go play with it. Does FirstNet illustrate the deficiencies of "ready, fire, aim"...or does it illustrate the advantages? One of the principles in the Peters/Waterman book In Search of Excellence is a bias for action - probably derived from the way in which the book itself was written. Peters and Waterman were both consultants on the margins of McKinsey, based in the San Francisco office. In 1977 McKinsey director Ron Daniel launched two projects; the first and major one, the Business Strategy project, was allocated to top consultants at McKinsey's New York corporate HQ and was given star billing. Nothing came of it. The second 'weak-sister' project (as Peters called it) concerned Organisation - structure and people. The Organisation project was seen as less important, and was allocated to Peters and Waterman at San Francisco. Peters travelled the world on an infinite budget, with licence to talk to as many interesting business people he could find about teams and organisations in business. He had no particular aim or theory in mind. This technique sometimes works, and it sometimes doesn't. Martin Zwilling has characterized the failures as "the dreaded premature execution syndrome." Zwilling asserts that different techniques are called for in different situations. I believe that many ... have benefited from [the ready-fire-aim] approach, especially in early startup stages. If your product is highly innovative, and speed to market is critical, you won’t get it right the first time anyway, no matter how cautiously you plan. After Sept. 11 exposed huge holes in the country’s public safety communications capabilities, Congress passed a law on Feb. 22, 2012, creating the First Responder Network Authority (better known as FirstNet) to build a nationwide wireless broadband network dedicated to public safety and emergency response. The nation’s 5.4 million first responders would no longer have to rely on commercial carriers to communicate and transmit critical information during major emergencies. So how should such a problem be approached? One could argue that because this is a critical initiative affecting thousands of public safety agencies, the development of FirstNet should be carefully managed to ensure that the system is designed correctly - the "ready-aim-fire" method. Alternatively, one could argue that a delay in the initiative could result in catastrophe and loss of life, should an emergency situation occur while first responders were still trying to get their communication devices to work. Better to get the work done now - the "ready-fire-aim" method. Ginn decided to do it fast, quickly hiring nearly three dozen technical consultants without going through a competitive bidding process. The technical consultants were people that Ginn and his private sector associates knew and trusted - people who could quickly build a reliable wireless broadband network. Unfortunately, some did not agree with Ginn's course of action. At which point you could ask, so what? Firefighters aren't experts in creating networks, so is there really a need to consult them? (I'm playing devil's advocate here.) After all, as long as Ginn and his people can get a network rolling, the firefighters and police officers can provide suggestions after the fact, and those can be included in version 2.0. The private sector does this all the time. Unfortunately for Ginn, one aspect of the FirstNet project gave the ignored firefighers and police officers some significant bargaining power. [P]ublic safety agencies aren’t mandated to use the network. “Once the network is stood up, there’s no requirement in the law that any public safety agency has to use it,” said [former Seattle Chief Information Officer Bill] Schrier. "If FirstNet doesn’t consult with its anchor customers at the beginning, it’s going to be harder to market later on.” And if too few public safety agencies use the network, it becomes less effective and more costly to run. This happens in government - and in business - all the time. Several years ago, I was trying to improve an internal company process by championing adoption of a particular tool. If this tool were adopted, I believed, we could realize significant cost savings. A wonderful concept - until one of the stakeholders told me that there was no way that he would use the tool. The effort died. Tammy Parker worded the news a little bit differently. Las Vegas bookies probably would have calculated pretty strong odds against Sam Ginn staying on as chairman of the First Network Responders Authority once his term expires in August. And that's exactly why Las Vegas bookies make money. "We are working toward several important roadmap milestones--including consultation with the states and territories and the development of a comprehensive network request for proposal (RFP) and an RFP for network equipment and services." Did you catch that word "consultation"? So, is this a failure of "ready-fire-aim"? Should Ginn have spent more time consulting with stakeholders? Did FirstNet effectively waste its time for two years because of the controversy? Or is this a success of "ready-fire-aim"? Did Ginn's tactics serve to jump-start FirstNet so that new leadership could, in the words of the anonymous communication flunky, enter "the next phase in its development"? Juan Valdez was content as he sat in the main room of his house. The windows were open, the air was crisp, and the aroma of coffee beans filled the air. Valdez had tended his family's coffee plantation for many years, but today he was relaxing and enjoying the peaceful morning. As he sat, he realized that he only lacked one thing to make it a perfect morning. "I need a cup of coffee," Valdez said to himself. Juan arose from his chair, went to his kitchen, and turned on his coffee pot. "My old coffee machine no longer works," said Valdez to himself. "I must purchase a new one." So he went to the barn, saddled up, and rode down to town. "I will be happy to help you," the sales associate replied. "In fact, we just got a new coffee maker in the shop that I know that you will love!" The sales associate asked Valdez to go to the appliances area, and she gestured at a store model of a shiny new coffee maker. "This," she said, "is the latest Keurig coffee maker." "It looks very different from my old coffee maker," said Valdez as he carefully examined the strange device. "Where do I put the filter?" "This is the latest technology, and a filter is no longer required," replied the perky sales associate as she opened up a small door in the coffeemaker. "You just put your coffee pod into this little area here, close the door" - she did so - "then you press a button and you get a single cup of coffee!" Valdez was amazed. "So," he asked for clarification, "I can just take my coffee, put it in a pod, and brew a single cup?" "You don't need to supply your own coffee," the salesperson clarified. "Keurig can provide coffee for you!" "But I like my own coffee. I am Juan Valdez, the greatest coffeemaker in the world. People all over the world talk about my coffee. I do not want Keurig's coffee. I want my own beans, that I have lovingly grown in the Colombian climate. I can use my own coffee, can I not?" The sales associate became less perky and less friendly. "Keurig cares for you," she said in measured tones. "Keurig does not want you to have a bad coffee experience with inferior coffee. Therefore, Keurig has taken steps to ensure that only the best Keurig-authorized coffees can be used in your new Keurig coffeemaker." Valdez stood there for what appeared to be an eternity. "I give up," Valdez said. "I will sell cocaine instead." The salesperson replied, "Have you heard about Keurig's new crack pipes? They use authorized Keurig cocaine from the finest growers. Would you like to become a supplier?" This date is circled in red here at the Empoprises headquarters on the 25th floor of a Guasti, California skyscraper. Or not. Why is this date circled? Because, as I've said ad nauseum (most recently in September), that is the date when a long-anticipated post is TENTATIVELY scheduled to appear. I say tentatively, because I cannot publish this post until something else happens, and that something else - originally expected to take place in October 2013 - has not yet happened. So, as I've previously stated, there is still a chance that my Thanksgiving post may not appear on Thanksgiving. I am continuing to monitor the situation, however. However, I am now going to give you a sneak peek into a small portion of the contents of that post. The statement below was not written by me, but was said by...someone else. Moviemaking is a very complex endeavor. If Katie Holmes wants to make a movie, she doesn't just go somewhere and say stuff. There are a lot of people involved in making a movie, and you need a bunch of scriptwriters and key grips and people like that to actually make a movie. And the work isn't done when the movie's complete. You then have to market the movie so that people will come and see it. For movies, that often means that you have to hold a gala premiere. "Through the seating map, we're creating a gamified fundraising experience — and a competition — for fans to raise as much as possible to sit close to their favorite star," Rob Mishev, head of business development at Eventbrite, told Mashable. Live Media Group worked with The Weinstein Company and Fathom Events to bring the Live Red Carpet Premiere of The Giver to fans in theatres around the country! That's a lot of stuff. Unfortunately for Live Media Group, the company alleges that it did all the giving...and the Weinstein Company just took away. The Weinstein Co. failed to pay the $137,640 owed for “The Giver” premiere and $94,617 owed for LMG’s work on the “Sin City” sequel, the suit states. The Weinstein Company hasn't made any statement on the lawsuit. Perhaps they just forgot to pay. I'm going to list four women who were executives at Bay Area firms in 2013. Your task is to guess which of the four made the most money. The answer? 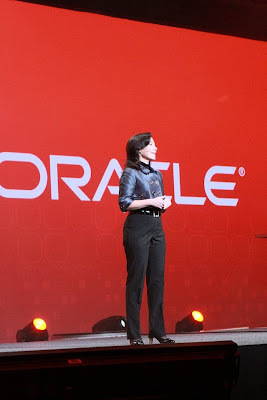 Safra Catz, who made almost twice as much as Mayer, with a 2013 income of $44.3 million. According to the San Francisco Business Times, this was actually less than she made in 2012. This was reported by the Business Times back in July, but its headline - "Highest paid female executive in the Bay Area isn't a CEO" - is now outdated, since Catz and Mark Hurd were promoted from co-presidents to co-CEOs. To some, these compensation figures seem obscene, but they are not unusual in the highest levels. Consider that basketball player Kobe Bryant makes more than all of these female executives, with the exclusion of Catz. I was recently forwarded a copy of an article, and the top of the article told us a little about the author. While I have changed some of the personally identifying information, the substance of the blurb remains the same. Mark Markson is chief operating officer at WidgetCorp, where he leads the company's worldwide sales team. Prior to becoming chief operating officer he was senior vice president of worldwide sales. Now I have no problem with most of the statement above. Markson was a senior vice president, in charge of sales. Presumably Markson was doing a good job, or else he would have been fired. In fact, he was doing so good of a job that he deserved a promotion. While he was still running worldwide sales, Markson was elevated from the senior vice president level. Yes - Chief OPERATING Officer. Now some of my best friends are salespeople, and I myself am involved in a sales role. But I'd be reluctant to add "operating" to my title. Yesterday, the Retail Industry Leaders Association (RILA) opened the 2014 Retail Asset Protection Conference in Indianapolis, Indiana with a keynote address from Rick Damron, Chief Operating Officer, Lowe’s Companies Inc. Addressing a crowd of almost 1000 asset protection professionals in attendance for the yearly educational and networking summit, Mr. Damron shared his perspective on the critical role of asset protection in delivering the overall customer experience, driving sales and customer satisfaction while mitigating risk. Keep the doors locked and the cameras on to make sure our assets are protected. That kind of stuff. Then again, perhaps I'm wrong. It turns out that my "Mr. Markson" isn't the only sales-oriented COO. Here's another one. As Microsoft’s chief operating officer, Kevin Turner leads the company’s global sales, marketing and services organization of more than 47,000 employees in more than 190 countries. Under his leadership, the sales and marketing group delivered more than $78.6 billion in revenue in fiscal 2013. Turner oversees worldwide sales, field marketing, services, support and partner channels as well Microsoft Stores and corporate support functions including Information Technology, Worldwide Licensing & Pricing and Operations. Su, 44, joined AMD in 2012. As chief operating officer, she handled product strategy, execution, sales and operations. Well, if they would just promote Markson to CEO - or maybe have two CEOs like Oracle - then there wouldn't be any confusion about what he does. My favorite U.S. President is Gerald Ford. I thought that I knew a lot about him - for example, the fact that Ford served in the U.S. Navy during World War II. However, I didn't know that he eventually attained the rank of Admiral. Many of you are familiar with John Glenn - Mercury astronaut, U.S. Senator, and (before his Mercury days) U.S. Marine who served in both World War II and the Korean War. But I bet that you didn't know that Glenn also attained the rank of Admiral. Perhaps you know about the feud between Harry S Truman and Douglas MacArthur. Despite their differences, they both had a lot in common. Both served in the U.S. Army, although General MacArthur rose to a slightly higher rank than Colonel Truman. But in one respect they held equal rank - both attained the rank of Admiral. In 1931, then Nebraska Lieutenant Governor Theodore W. Metcalf found himself to be Acting Governor for several weeks. To please some of his friends, he appointed "20 to 25 prominent Nebraskans" as Admirals; hence, the Great Navy of the State of Nebraska was born. Eventually, a 501(c)3 non-profit organization (the aforementioned NAA) was founded, and while all of the 100,000+ admirals are not active members, enough of them are around to satisfy the purpose of the NAA. •To enjoy fun activities such as "walking the plank"
•To continue efforts to have U.S. Naval ships named after Nebraska, its people and places. However, as of 2008, future Nebraska Admirals must be residents of Nebraska. Perhaps you may not have noticed, but it's October. And while old people like me celebrate Rocktober with abandon, younger folks know that October is the time to wear pink. Yes, everyone, get rid of all of those ice buckets from the summer ice bucket challenges, and wear pink to show that you care about breast cancer. After all, our National Football League is telling us to wear pink - despite the fact that some allege that the NFL's efforts amount to "deadly misinformation.". But the ALS ice bucket challenge and the various breast cancer challenges are just a small part of what's going on. There are all sorts of things - homeless puppies, homeless people, global warming, bullying - that vie for our "awareness." And we don't want to be selfish, uncaring people, do we? So some people try to be aware about everything, and end up getting overwhelmed by this. This need to be aware about everything has a name - "compassion fatigue." And, needless to say, we need to be aware about it. Yes, Virginia (and Maryland), there is a Compassion Fatigue Awareness Project. And yes, I'm sure that they mean well. Everybody means well. Although we have reached so many people and organizations that have reached out to us, we still feel like we have only just begun. Over the years, we have noticed a major obstacle to starting down the path to authentic, sustainable self-care for many organizations: financial constraints. Let's face it...Whether it's purchasing books and training materials, providing professional development for staff, or inviting guest speakers to lecture on current topics in healthy caregiving, everyone is concerned about decreasing budgets. But often times, a single step in the right direction is all it takes to get the ball rolling. Which is why we have started the $1,000 CFAP Challenge! And if you don't donate to the CFAP Challenge - well, then, you're a terrible person who just doesn't care. I'm pretty sure that CFAP wouldn't say that, but the tendency to think it is still there. I wonder if someone has started a compassion fatigue fatigue organization yet. Remember my previous post about employee attendance at a particular government ministry in the nation of India? It told about the experience of minister Prakash Javadekar (of the Ministry of Information and Broadcasting), who showed up to work one day and discovered that some of his employees weren't at work yet. The minister was not happy about this, and came up with a solution - biometric attendance terminals. An electronic surveillance system to keep track of punctuality of government officials will become fully operational by the month end as part of Narendra Modi Government's efforts to discipline employees. On its own, this statement is not earth-shattering; biometric attendance systems have been around for years. Of course, the sheer size of the endeavor is astounding, because everything in India is astounding when population is considered. The website, attendance.gov.in, is hooked up to computers in government offices that will identify employees through their fingerprint and unique identity number (Aadhaar). It displays a dynamic, real-time chart of how many people are at work. It is also possible check when an individual checks in and logs out of the system. Now that isn't all that surprising. Dynamic, real-time charts - or dashboards - have also been around for a while. Dashboards would provide a nice way for Indian government officials to measure attendance. I mean, the view is primarily for Indian government officials, isn't it? Um, before I answer that question, I'd better add another disclosure. I went to http://attendance.gov.in/...and guess what I saw? Yes, I, an American, was able to look at a website and see how many Indian government employees were working at that particular time - at least for the agencies that have already been added to the system. You can drill down to specific agencies, such as "Director General Defence Estates (DGDE)- MOD," and see how many people are working. And if you're an Indian citizen, and you're waiting on some Defence Estates business, and a bunch of the employees are out of the office, you can fiercely complain or do an Occupy New Delhi or whatever it is you want to do. Of course, if you're an Indian government employee, this isn't the best news in the world. As I mentioned in my previous post, an employee may have a valid reason for not being at work on any particular day. But that doesn't matter to the dashboard. Of course, you don't have a lot of government officials working in India during lunchtime in California - it's the middle of the night out there. But if you live in the United States, and you're having a sleepless night, perhaps you can entertain yourself by going to http://attendance.gov.in/ and count Indian bureaucrats. There are a variety of laws that allow the public to request information from various governments. For the United States government, the relevant law is called the Freedom of Information Act. Various states and localities, as well as other countries, have their own laws. In principle, this allows the press to research particular government actions, and to report wrongdoing if found. Of course, this can be used in other ways - for example, whenever a contract is awarded in my industry after a Request for Proposal (RFP) has been issued, there's a mad rush by all of the competing vendors to get copies of the proposals of all of the other vendors. There's a small town in Missouri - Ferguson - that's getting a lot of these records requests lately. And according to the Associated Press (one of the organizations requesting the information), there are issues with those requests. I'd tell you what the Associated Press is saying about this, but as you may recall, the AP has its own rules about appropriating content from its articles. So, in order to keep from running afoul of the AP, I am only going to quote one word from the AP article - the first word. Hint: when your article about a government agency begins with the word "bureaucrats," the results aren't going to be flattering to your agency. A growing number of media outlets claim that Ferguson, Mo. is charging way too much money - $2,000 or more - to respond to Freedom of Information Acts requests about the [Michael] Brown shooting. The high fees seem to fly in the face of Missouri's Sunshine Law, which states that copying fees for public records shall not exceed 10 cents a page, with the hourly fee for duplicating time not to exceed the average hourly rate of pay for government clerical staff. Ferguson and its consultant, Acumen Consulting, seem to be getting around this by charging research fees - fees to find the information in question, fees to review the information to find out what should be redacted, and the like. Jim Gaffney, vice president of RJ2 Technologies in Schaumburg, Ill., said a basic keyword search can easily turn up words, strings of word, or statements that appear anywhere in an internal or external email account. The key, though, is having an active archiving service, Gaffney said. Popular office email systems such as Microsoft Outlook have a feature that can be turned on or off, which automatically archives emails either 90 days or six months after they were received, he said. And if those features aren't turned on, there are other ways of getting the information. A forensic identification process involving the installation of software can usually track down lost documents within a few days, Gaffney said, by searching for the whole laptop or desktop for key phrases, or people and places named in the document. So all that we have to do is to get the Ferguson Police Department to install some forensic...well, when the investigating agency is a party to the case in question, that gets a little more difficult. I haven't come up with an Empoprises Rule in a while. I've come up with four such rules in the past. And I was just inspired to come up with another, after seeing the title of a particular article. I'm not sharing a link to the specific article, because the specifics aren't important here. What is important is that this was a list article. Despite the fact that "social media experts" claim that list articles are powerful, list articles truly are powerful. If I see an article that promises to show me three items, my brain is looking for those three items, and hooking on to them. The presence of a defined list helps me to retain the information that was shared in the article. One day I ran across an article that promised something, but when I saw what it promised, I really didn't want to read the article. It wasn't that the article contained information that I didn't want to read. It was the fact that the article began with the words "22 Examples." Perhaps it's my online short attention span, but while I'm willing to read three things, or five things, I don't want to read dozens of things. As I mused upon this, I hit upon yet another Empoprises Rule. As with all such rules, I'm copyrighting the thing so that I can make tons of money giving seminars. So here's the new rule, called the Empoprises Rule of List Length (copyright 2014 John E. Bredehoft). If you have to take off your shoes to count the number of items in a list article, your list is too long. While this rule is powerful and amazing, it does cause me some concern. You see, since I now have the Empoprises FECES Rule of Corporate Me-Tooism, the Empoprises RCDCR Rule of Insider Food Talk, the Phineas-Hirshfield Score, the Empoprises Rule of Anecdotal Evidence Propagation, the Empoprises Rule of List Length, and the (still in work) Empoprises Rule of Fair Food...I can only come up with a few more rules before I end up violating this latest one. Louis Gray wrote a post about his health - and yes, the post was tech related. Not only did Gray discuss two tools that he uses to measure various aspects of his health, but he also discusses one of the reasons that he' doing more walking than driving. But even as I've been on something of a Fitbit kick since early 2012, I've reached even higher highs in the last month-plus, and increased my daily goal to 15,000 steps (from 12,000), thanks to one simple change - opting to leave my car at home each workday and benefit from one of Google's most visible perks, taking the company shuttle. Rather than walking to his garage or driveway, getting in a car, and driving off to work, Gray now walks to a bus stop. The bus stop is not in front of his house. Hence, better health. It is important to note that Gray does not live in the city of San Francisco - he lives out in San Mateo County or Santa Clara County or somewhere out that way. Because when people mention words such as "Google bus" - especially in connection with the city of San Francisco - a class war is in danger of erupting. For example, if you perform a (Google) search for "Google bus," this article from a few months ago appears near the top. Tech industry shuttles have become a symbol of economic inequality and gentrification in San Francisco, sparking a variety of protests since late last year. Now, activists are trying to hold city leaders accountable for letting those shuttles use public bus stops, and allowing them to operate without regard for their environmental impact on the city and its residents. A coalition of activist groups is suing the city, county, board of supervisors, the local transit agency, the shuttle companies, and Mayor Ed Lee himself, for creating a pilot program that charges bus companies just $1 per stop and granting it a special exemption from California's environmental review law. To be fair, not all activists are anti-Google; Mother Jones praises the environmental features of the buses. But there continues to be concern about the whole thing in some circles - especially since the bus drivers are not Google employees, and often have to sit around, unpaid, waiting to pick up the next set of commuters. However, it is also important to note that Google is not the only company that sponsors employee shuttles. Facebook has its own set of shuttles, and, like Google, Facebook contracts with a third party to provide the shuttle service. Please be advised that I am writing on behalf of a majority of the bus drivers who pick up Facebook employees from San Francisco, Palo Alto, and a number of other destinations, and deliver them to the Facebook campus. This is the second time that they have come to Teamsters Local 853 seeking representation in order to improve their livelihoods for themselves and their families. And yes, there's a little bit of class warfare talk here also. This is reminiscent of a time when noblemen were driven around in their coaches by their servants. Frankly, little has changed; except the noblemen are your employees, and the servants are the bus drivers who carry them back and forth each day. Now I don't know how comfortable the "occupy" folks will be in aligning with the Teamsters - the Teamsters just want the bus drivers to get better pay, while the occupiers want the buses to stop altogether - well, except for their own buses. However, the Teamsters are clearly poised to take action. Take Walmart, admittedly not a friend of unions. A Southern California Teamsters local is boycotting Walmart, and I have a relative whose family does the same. While I may not agree with this relative's stand, I certainly respect him for putting (or not putting) his money where his mouth is. From the Teamsters perspective, it makes perfect sense to boycott Walmart, or any retailer that does not use union truckers. But will my relative eventually be asked to participate in a boycott of Facebook? Silicon Valley is Devoid of Reason - Ms. Merkel, tear down this firewall! The Condescending Corporate Brand Page is a page on Facebook that is fond of noting when particular brands go a little too far to cash in on some historic event. I'm waiting for the page to cast its eye on its host. Today is the anniversary of Germany’s re-unification. Next month is 25 years since the fall of the Berlin Wall. When people are connected, they can bring down walls and lift up nations. Let’s keep working so that one day everyone is connected -- and there are no more walls that divide us. Yes, that's right - a guy who shows ads to people who post cat pictures is saying that the ability to be "connected" to his service is comparable to the ability for an East German to visit his family in West Germany without getting shot. And why, oh why, would Zuckerberg be so interested in being "connected" in Germany? "Even though Facebook says it will deliver only anonymous data without names to advertisers, this almost continuous monitoring should leave many customers with an uncomfortable feeling," they said, adding that with such detailed profiles real anonymity can hardly be maintained. And if enough people follow VZBV's suggestion to install ad blockers, Facebook will start to feel very unconnected with profitability. And to a Silicon Valley insider, ad blocking is worse than Communism. So I was reading an article by Lisa Pafe. While Pafe notes that you can't worry about everything, there are a few times when you should take action. Here's one of them. For more of Pafe's thoughts on this and other items, see her original post. 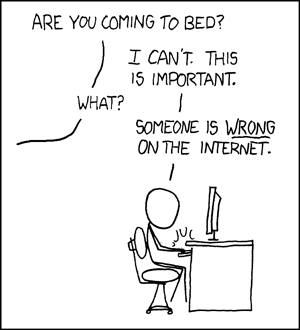 As the comic illustrates, there are times when we - and I definitely include myself in that category - are OVERLY committed to correcting things. I don't mean to embarrass the company in question, because this could happen at multiple companies. It could happen at my company. For all that I know, you may have similar problems reading my stuff. Anyway, I read an excellent article from this company that discussed some ways in which salespeople can make sure that they listen to their customers. The top of the article included some buttons that allowed you to share this article with others - obviously the company wants its message to go out. One of those buttons was for LinkedIn, but when I clicked on the LinkedIn button and got the small window allowing me to share the article, the article's title was listed as "403 Forbidden." That was not the actual title of the article. For whatever reason (and perhaps it's some weird firewall issue for all I know), the company's article title would not show up when you shared the article. I wanted to alert the company about this issue, and I had already captured the picture above, so I figured that I would email the picture to the author of the article, or to someone else at the company. So I went to the company's website, found the "Contact Us" page...and was greeted with a response form. And no, the response form did not allow you to attach pictures. I then did another search, to see if I could find some other page for the author of the article. I did, and the page listed the author's phone number. Well, unless that phone is a cell phone, there's no way to get a picture through that transmission line. Although the company tried to set up things really well - sharing buttons, contact forms, phone numbers - the company didn't provide the one way that I wanted to contact it, an email address. So despite its efforts, the company didn't want to listen to me. I guess we should add a Rule #7: Make sure the customer has a way to contact you.